A great article showcasing not only the toy, but how it works and it's later expansions. 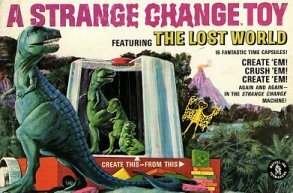 In 1968, the Mattel toy company produced an interesting little toy called A Strange Change Toy, and the particular one in question features a Lost World senario. This set included 16 plastic capsules that when placed into the heating machine (nestled ever so snuggly into a vacu-formed mountain terrain) strangely changed into 16 different dinosaurs and "prehistoric monsters", or really big spiders and snakes. there was also a pair of tweezers and a paper play-mat with a printed "lost world" environment of jungle, a central lake, and volcanoes... A sort of overhead map or photograph thing. Being almost 30 years old, this is a collector's toy, so if you are looking for it, expect to pay around $100 for it in good condition with all the figures, mat, etc. They crop up on eBay once and a while.